Are Extrasolar Worlds More Likely to Be Water-rich? Authors: Fred J. Ciesla, Gijs D. Mulders, Ilaria Pascucci, Daniel Apai. First Author’s Institution: Department of the Geophysical Sciences, The University of Chicago, 5734 South Ellis Avenue, Chicago, IL 60637. Paper Status: In preparation for the Astrophysical Journal. Scientists in many fields see the presence of water as a major ingredient for the potential of an ecosystem to support emerging life – however you want to define life. This might result from our lack of creativity to imagine beings in the absence of water, and is likely a direct consequence that we only have one “life benchmark system” which we know for sure. Of course, we are working hard on resolving this drawback of our ideas, as was just shown by researchers who modeled an oxygen-free cell membrane which might fit in the chemical environment of Saturn’s moon Titan. Anyways, since hydrogen is ubiquitous in the Universe and we can be sure that a watery environment acts as an excellent breeding ground, looking out for water in other worlds seems still to be our best bet. 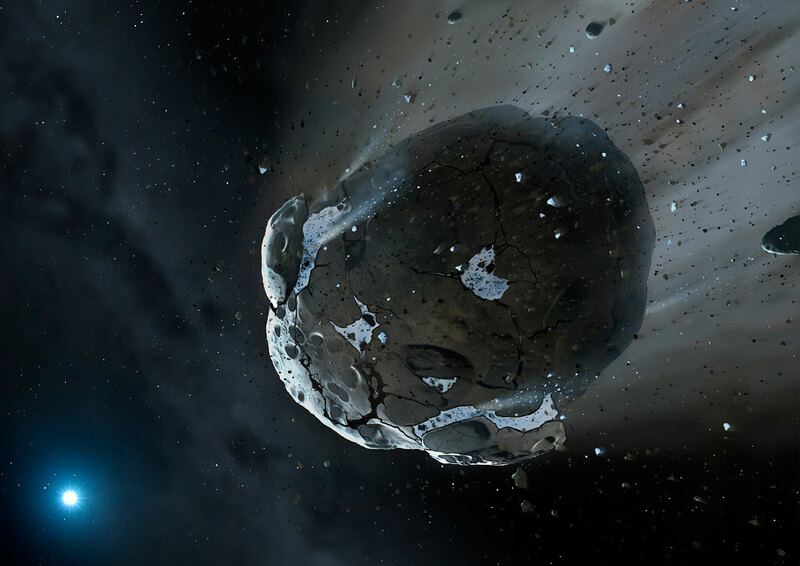 Figure 1: Artist’s impression of a rocky and water-rich asteroid being torn apart by the strong gravity of the white dwarf star GD 61. Similar objects in our solar system likely delivered the bulk of water on Earth and represent the building blocks of the terrestrial planets. Credit: NASA, ESA, M.A. Garlick (space-art.co.uk), University of Warwick, and University of Cambridge. To be able to make a statement about the conditions all around us in the Universe we first need to understand where all the water on Earth came from. A nowadays favourited idea to explain the massive amount of water on the Earth’s surface is that most of it was accreted from water-rich impactors. In the early phases of its formation the Solar System underwent a phase of chaotic dynamics – the so-called Late Heavy Bombardement. We can see that this event most likely happened at approximately 4 billion years ago in lunar rock samples from the Apollo missions. During this time a high number of asteroids collided with the terrestrial planets. But why is this important for the water on Earth? Since the Earth formed at a distance to our Sun where the temperatures are high in the protoplanetary disk (a lot of astrobites already exist on this topic here and in general here) not much water was incorporated in its bulk material. (This is also explained comprehensively in this astrobite.) However, the small bodies in the outer parts of the Solar System formed farther away and therefore harbour higher volatile (chemical species that go into gas phase easily, so including water) reservoirs than the inner terrestrial planets. This lead to the thinking that most of the water we see in the oceans today was brought to our planet after its formation. What about other planetary systems? When looking at other systems far away from ours, we can ask: did they emerge from the same conditions as our own? Probably not always. Sure, we find a multitude of systems to resemble the Solar System, systems with multiple planets, super-Earths and so on. However, there is a crucial ingredient which determines the amount of volatiles in the primitive planetary bodies: the amount of heating by short-lived radioactive isotopes like . These dominated the heating in early Solar System bodies and are the cause for most of their volatile loss (by outgassing to the surrounding). is likely variable across different planetary systems around solar-type stars and therefore other planetary systems might have more volatiles and thus more water! And that’s now the author’s approach in this study. They adopt conditions for higher volatile enrichment than in our Solar System and calculate the gravitational dynamics and evolution of the bodies in these systems. To do so they use the N-body code MERCURY which models each body around the star as a particle and then calculates the gravitational interactions in between them and the resulting orbits and eventually impacts. Each individual particle is given a certain volatile mass fraction. 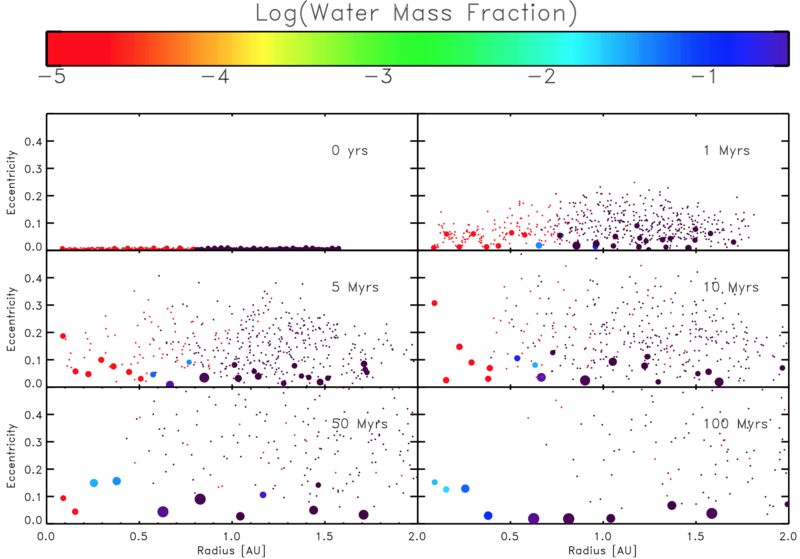 They also account for the differences in stellar masses and the resulting changes in the extent of the habitable zone (in which liquid water can exist) and the mass of the disk around them (higher stellar mass in principle means there was more material available in the beginning and thus we also expect more material in the surrounding). Figure 2 gives an idea about how the outcome of such a simulation looks like. Initially all bodies are arranged in a certain distribution around the central star and then are dynamically evolved. After a certain amount of time most of the initially small bodies have been accumulated to bigger bodies and the resulting small ones are on very eccentric orbits. Now, running simulations with initial values alike the Solar System and with higher volatile fractions enables the researchers to study the impact of such changes. So, plenty of Kaminos out there in the wild?! Kamino? Sadly, we cannot know for sure at this point. We can imagine a lot, put as much knowledge, hard work and precision in our simulations as we can – in the end all our physical descriptions of the real world out there are just approximations, some better, some worse. Therefore, the authors of this study try to identify trends in the results of their simulations that might in the future enable them or others to compare their outcome with the distributions of observed exoplanets (see Figure 3). 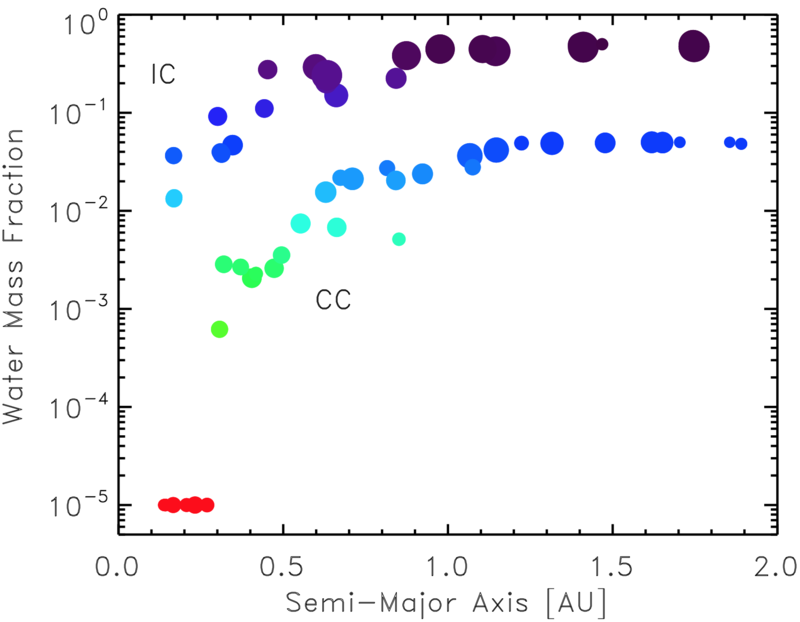 This is a very hot topic in exoplanetary research – do statistics with the observed distribution of planets and allocate trends to understand the origin of planets in general. What they find is that adding water to the outer bodies in comparison with the value of the Solar System leads to much wetter planets. Additionally, they find that low mass stars are the host of of more planets of lower masses, whereas in comparison the stars with higher masses end up with less planets, but more massive ones. These are relevant descriptions of the stochasticity of planet population synthesis (the study of the planetary population on a statistical basis) and thus gives clues whether our ideas are right and may or may not coincide with reality. This eventually enables observers to refer to when we have detected and characterised (!) enough exo-worlds to do reliable statistics about it and be in a state to find out whether at least some of our understanding withstands a critical check. You say “watery environment acts as an excellent breeding ground”, but isn’t that still based on observations only on Earth? Hey Zoey, thank you commenting on this post. I am sorry to reply so late, as unfortunately I did not notice it before. Regarding your question: As you can read in my newest bite (http://astrobites.org/2015/06/26/natures-starships-vol-i-ride-in-on-shooting-stars/) actually there is evidence that water IS an excellent breeding ground from meteorite samples – at least for amino acids, the most basic ingredients for organic compounds.